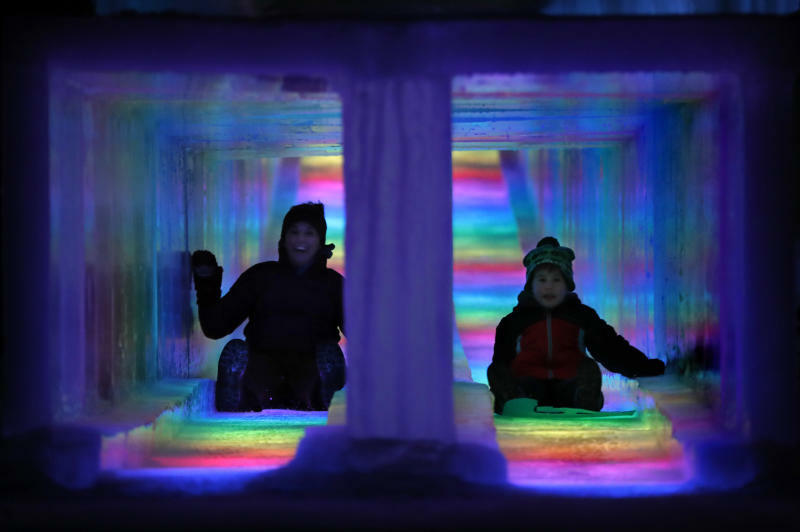 NORTH WOODSTOCK, N.H. (AP) — On a clear, frigid night in a courtyard made of walls of ice, Bruce McCafferty and his young son stand mesmerized, bathed in the pulsating rainbow light emanating from a series of stout ice formations. McCafferty and his son Dougie have come out to Ice Castles in North Woodstock, New Hampshire, a collection of ice tunnels, caverns and a 97-foot (30-meter) ice slide that cover an acre (half a hectare) of farmland that some have said are like something out of the movie "Frozen." The winter wonderland, one of six in North America, is built from scratch when the cold conditions allow the ice to sprout from the barren ground. Other parks are located in Lake Geneva, Wisconsin; Excelsior, Minnesota; Dillon, Colorado; Midway, Utah; and Edmonton, Alberta. This year, the attractions will stand until early March in most locations. At the center of the New Hampshire attraction stand six ice structures that are nearly four feet tall (more than a meter tall) and are lit from within by colored lights. "It's quite magical, isn't it?" McCafferty said. "It's an amazing creation. I'd really like to know how they actually built it." The attraction starts small in December, when the site's lead builder Matt Pasciuto and his team set up icicle farms: metal racks that are sprayed with water to allow icicles to grow on them overnight. 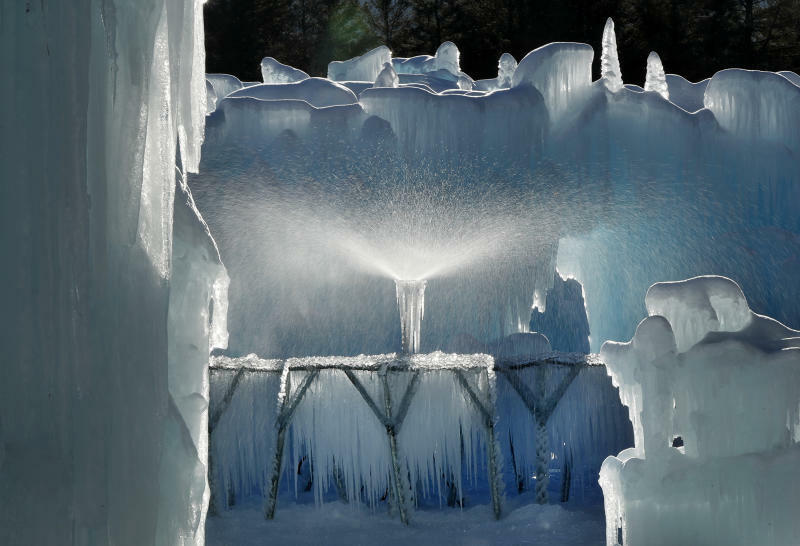 The icicles are then harvested by "ice artists," who place them around more than 70 sprinklers. "Once we turn the sprinklers on, the water starts freezing to those icicles, making them grow together, bigger and bigger and thicker and thicker," Pasciuto said. "We grow the castle about two to three feet (a half-meter to one meter) at a time." Within a few weeks, the icicles have managed to cover the entire park, and some reach heights of 20 feet (six meters). On a recent sunny day, the massive ice walls shined with a glacial blue hue. After the sun went down, the castles burst with colors thanks to LED lights embedded in the ice. The astonishing visuals are complemented by a synchronized fantasy soundtrack playing throughout the venue. The attraction, which moved to this year from neighboring Lincoln, draws tens of thousands of visitors each season. "When the movie 'Frozen' came out, that was a huge boost because now everyone says, 'Oh, we get to see an actual ice castle,'" Pasciuto said. 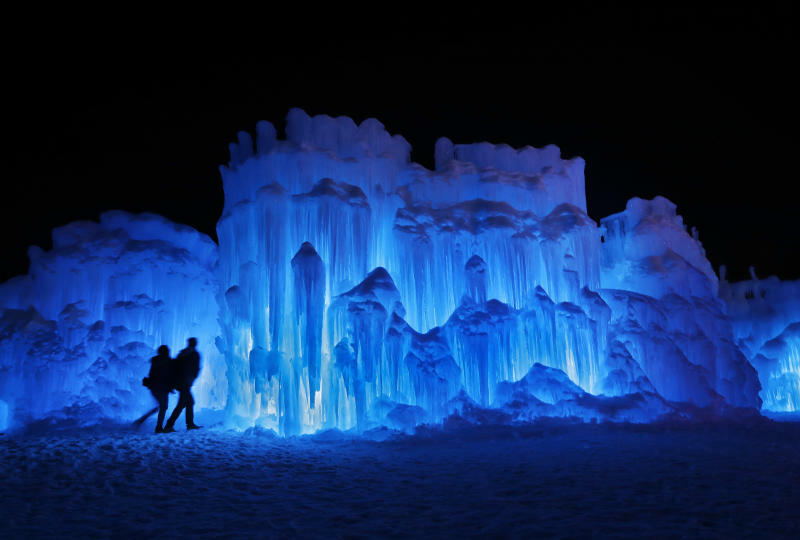 Three years ago, Adam Schellinger started bringing his girlfriend on annual dates to the Ice Castles in New Hampshire, a three-hour drive from their hometown of Brooklyn, Connecticut. On last year's visit, Schellinger got down on one knee and popped the question. The crowd immediately cheered. The couple was married in September. "When I proposed, it was blue, and then it went to purple," recalled Schellinger, who returned for a visit with his wife Ashley a couple weeks ago. "It was just awesome — a great backdrop for sure." After a mild start to the winter, the weather in New Hampshire this year has mostly cooperated with only a few days with above-freezing temperatures. But that isn't always the case, according to Melissa Smuzynski, public relations director for Ice Castles. She said some locations occasionally have had to cut their seasons short due to warmer winters but that "we haven't noticed a long-term pattern over the years of our seasons becoming shorter." But Pascuito says he dreads the warmer days. "The last couple of years we've had some really bad warm spells in February where it gets to 60 degrees (Fahrenheit, 15 degrees Celsius). This is New Hampshire — that shouldn't happen," he said. "We love the cold. We want a nice long winter."